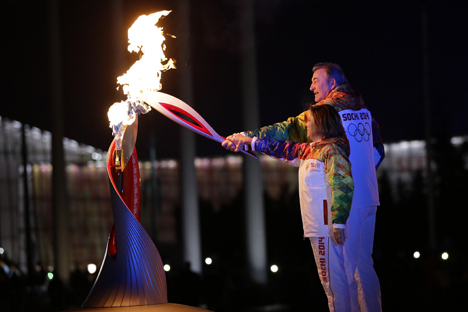 Legendary ice hockey player Vladislav Tretyak was given the honor of lighting the Olympic Cauldron at the Sochi opening ceremony. ‘The Goalie’ still casts a spell on those around him. Working for the International Ice Hockey Federation puts reporters and other staff in a hotel full of people more than familiar with rubbing shoulders with hockey royalty. After all, among our fellow guests we have representatives of various national federations, the NHL Players’ Association and the IIHF itself. For guys like this, meeting the biggest names in the game is hardly a new experience. But one name still towers above the rest: Vladislav Tretyak. Famed as the goalie – for those who grew up watching him perform heroics between the piping for the invincible Soviet ‘Red Machine’ of the 70s and 80s no other description is needed – he now cuts an avuncular figure. And even in the hockey hotel his arrival still causes a stir. Take the morning after the opening ceremony, which concluded with Tretyak and champion figure-skater Irina Rodnina setting the Olympic Cauldron ablaze. A combination of a late night and generous quantities of free wine led to a subdued atmosphere over breakfast - until Tretyak arrived. Even for those well used to encountering famous sportsmen, Tretyak’s aura remains irresistible. Autograph and photo requests followed quickly, and were dealt with in good humor. Despite Tretyak’s fame, he remains a kind of prototype for the nation’s favorite granddad. It’s that combination of greatness and humility that made him the perfect choice to light the cauldron; it’s the same combination that ensures that now, just as in his playing days, you’ll struggle to find anyone with a bad word to say about ‘the goalie’. Andy Potts is a sportswriter and RBTH freelancer who is attending the Sochi Games as part of the International Ice Hockey Federation.